This post is coming on the tail of my last post, What Scares You Most About Sending Your Food Allergic Child to School? Many of you came and shared your stories and your very real fears about how you are really feeling about this. If you have not yet, make sure to go over and share how you’re feeling about sending your kids off to school with food allergies this year – your stories will help other moms and dads to see how NOT alone they really are right now. I told you I would be sharing some important resources and tools to help you ease some of those fears and give you a good game-plan so that you feel more in control. I have put together a number of tips, resources, and links to tools that you can print off while you are developing (or enhancing) your Food Allergy Action Plan. 1. Build an Alliance with the Teachers, the Administrators, the School Nurse, Extra-Curricular Teachers, Bus Drivers, and even the other parents in the class. 2. Write a Friendly Letter to the Other Parents in the class explaining the nature of your child’s food allergies and their possible symptoms and reactions to their allergens. Have a picture of your child at the top of the letter, so they can put a face with the name initially. Chances are your child will keep many of the same friends through the years, so making the parents of these children aware early on will allow them to become very familiar with your child’s needs and food restrictions. This will also help as your child grows older and starts to gain more independence and can also help other parents understand to keep vigilant about keeping an eye on your child when you are not there. 3. Help everyone (from teachers, to administrators, to other parents) understand that every single child with food allergies is different and that every reaction can look very different. 4. Have a 504 Plan in place. While this is a personal choice and is optional, a 504 Plan may be the best way to protect your child in the classroom. Even if your relationship with your school is very good and you have open lines of communication, having a formal, legally enforceable plan may prevent your relationship with the school from becoming adversarial. It helps ensure that expectations for everyone – parents, children, classmates, food services workers, nurses, and administration – should be clear after the 504 is completed. 5. Make sure that everyone in regular contact with your child knows how to use an EpiPen and has had the right training to do so (if your child requires this as an action for a reaction). Make sure that there are multiple EpiPens available and that everyone knows where they are stored. 6. Encourage your child to feel brave enough to immediately let someone know if they think they are having a reaction. This is something I had to really work on with my own son…we had to do some coaching with him to overcome feeling embarrassed or afraid of letting someone know if he was not feeling right. As they get older, their understanding of their food allergies becomes a blessing and a curse. A blessing because they understand far better what they can and cannot eat or be exposed to. A curse because they also have a greater awareness of the social aspects where embarrassment can begin to play a large factor. 7. Make the School Nurse Your BFF… seriously. Become really good friends with him or her. They will be an extremely important part of your support team. Making sure that they are in full understanding and completely on board with everything to ensure safety for your child will be crucial. 9. Offer to do a Presentation to your child’s class or, better yet, to the entire school about Food Allergy Awareness and Bullying Awareness for children with food allergies. 10. Keep an Allergy-Friendly Snack or Treat box in the classroom at school for your child. Have them help pick out some special and safe treats that they will enjoy eating when there are party treats or food events going on in the classroom. Let them be involved in picking out what they want to keep there. There should also be a “No-Food Sharing/Trading” policy in the classroom. 11. Volunteer to help coordinate Food-Related events and parties in the classroom. This way you can assign allergy-friendly versions of food items and create a list of party-treats that may be safe for the children in the class with food allergies. I have found this to be a huge benefit in ensuring that safe treats are going to be involved during the events. It may require a bit of your time, but often the peace of mind is well worth that effort. 12. Volunteer to be the Room Mother or Room Father. Again, a definite investment in time but the benefit is having a little more access and control to what food and activities will be involved in the classroom. 13. Team up with other parents in the classroom who also may have food allergic children. There is power in numbers and together you may be able to really work with the teachers to create a safe environment for your children. Perhaps you can also create a schedule and take turns attending the different events, field trips, and parties and help watch out for each others children. 14. Plan for field trips and activities and know (and get in writing) who will be carrying your child’s epi-pen or safe food during the outing, if you will not be present. 15. Do not let your children sense your own anxieties about their food allergies. Let them see you feeling in control. It will help them to feel more in control as well and it will give them a greater sense of confidence in dealing with their special diets. Plus, it will not put additional anxieties and worries onto them. Honestly, I feel like #15 is probably one of the most important points. Our children are so in-tune with our emotions and will model our actions. If we are stressed and anxious….then, guess what? They will be too! It is so important for us to minimize the psychological impact of food allergies for our children. 16. 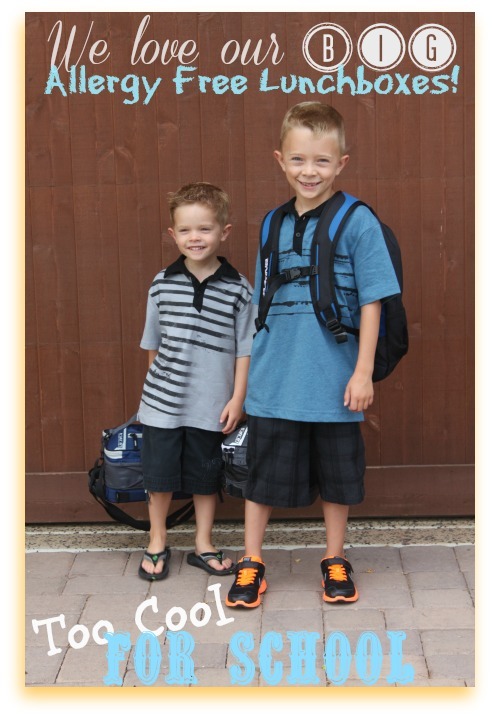 Take advantage of the many amazing online resources for sending your child off to school. They will give you the tools, forms, and peace of mind to start this year totally prepared. 17. 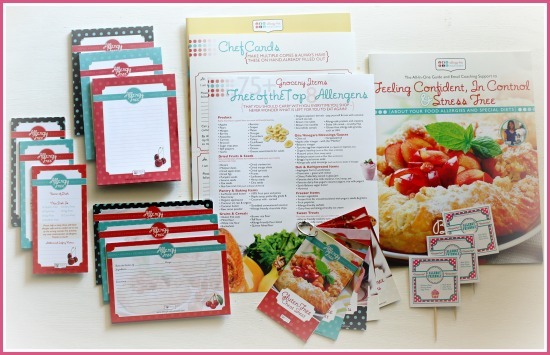 Get the Food Allergy Handbook and Entertaining Kit with tools for all of those school parties! Right now you can use code: PARTYKIT25 to get 25% off the kit!! Develop a coordinated care plan in advance of the first day of school. 15 Free Featured Posts about Sending Your Food Allergic Kids to School – from Kids With Food Allergies. Managing Food Allergies in the School Setting: Guidance for Parents – from FAAN. This free download is an invaluable tool. Please print off a copy. Food Allergy Action Plan from FAAN – Has a Printable Emergency Action Plan that should absolutely be filled out and passed out to everyone in contact with your child to make sure that everyone knows the immediate steps to follow in case of a reaction. The Safe@School Program from FAAN – has some great resources for for school nurses or administrators to conduct in-service training about food allergies and anaphylaxis along with an online food allergy tool kit for school nurses. Food Allergy Education Modules from AllergyHome.org – have free food allergy training modules for school nurses, extended staff, teachers. Allergy Alert Labels from Name Bubbles – laminated waterproof Customizable Food Allergy labels for backpacks, water bottles, cups, and lunchboxes. So let’s get this year started off right and put our plans into action! This post is being shared with Allergy Free Wednesdays! Thanks for including some of our tips and resources on your page. For your #2 tip, I would suggest having the school principal notify the parents instead of the parent of the child with allergies to avoid a potentially adversarial situation between parents. Training resources for schools and the school community are also available at http://schools.allergyhome.org. Good point, Lynda. I do know many families who have sent a very friendly letter/email to the families in their class and have gotten only very positive feedback, myself being one of them. 🙂 However, I definitely understand what you are saying about wanting to avoid any uncomfortable situations between parents. 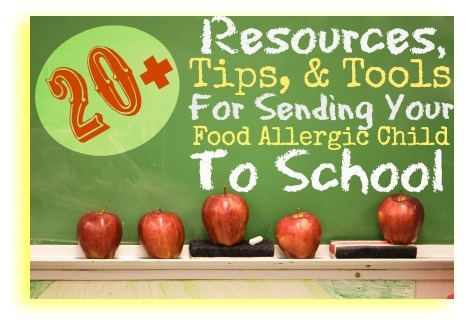 And thanks for sharing http://schools.allergyhome.org – that is an awesome resource as well. This is such a great resource for parents of children with food allergies. We have our issues with intolerances (including celiac), but I am thankful that I don’t have to fear life threatening allergies. I have a friend that deals with this and it’s horribly frightening. I will be sharing this one! Thank you for putting this together! Thanks so much, Sarena. You are so right about it being frightening. Sending your kids out the door with life-threatening allergies and not being able to control what goes on throughout their day is one of the hardest things to have to be able to deal with, I think! Kim- this is such a thorough and thoughtful list. I love item #6- it’s so important that our kids are comfortable advocating for themselves. Although it is a lot of work to have kids with food allergies, I can see one benefit: you have a great incentive to be more involved in their classrooms— what a blessing! A final note: where did you find those adorable “school kids” models? They are the cutest! I just wrangled up some random kids from down the street for this little photo shoot.JK LOL Thanks! Thanks! 😀 I figured you would have printed it out..
Great tips Kim! And I don’t think I’ll ever tire of that adorable picture! Such an outstanding post, Kim! I can’t wait to share it with my gfe Facebook readers! And I agree with Alisa on the photo of your two cuties. Like I’ve said before, it must be tough being the mom who has to occasionally discipline when you are looking at sweet faces like those. 😉 Oh, and I love that into photo/badge, too. Very cool! Oooh! Great tips! Going to get my youngest daughter checked out for celiac and other allergies so I sure I will refer back to this list again and again if we end up in that boat. Just wanted to share with you all the free allergy printables for kids. There’s posters, labels, treat toppers, signs, stickers, lunch table allergy aware signs, travel labels, worksheets and so much more for a variety of common food allergies. There are also holiday allergy aware labels with Halloween and Thanksgiving coming up. All the allergy printables are free and are a great way to share at home, school and daycare that are fun and easy to print. Allergy printables are located at http://www.kidscanhavefun.com/food-allergy-printables.htm.